Capture content nodes are nodes in "scrape page" nodes to assign which content will be captured and will be saved into which column. It notifies the program that you wish to extract specific data elements from the page. See select target. Assign which DOM on pages will be captured. 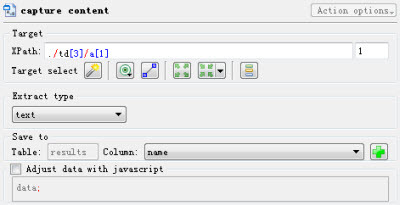 Use the extract type selector to specify which attribute in the selected DOM(s) is to be extracted. The default setting is for text, however, you have a number of options include the element's HTML, DOM attribute, page attribute, download elements and regular expression, static data. Capture text content of the target(s). Capture HTML code of the target(s). Capture Dom attribute of the target(s), here you should input the attribute name(e.g. href, class...). For example, if you want to scrape URL of a link, set it to "href"; if you want to scrape URL of a image, set it to "src". Capture attribute of the page. Here you should assign a folder to hold the downloaded files. Link: Download file from the link of the target. Image: Download image of the selected target. Wait download: Wait download is for some special situation and the program will wait until some download request(e.g a page has a button, when click button something will be downloaded). Screenshot: Create screenshot of the page, and save it to the folder. will scrape email address. It must contain parentheses, FMiner will extract string in brackets. [!current_time!] - The time stamp when save the data. [!start_time!] - The time stamp starting the project. If you assign a data table in its ancestor "scrape page" node, you can select a column field to keep this value. And you can also use regular expression to adjust data.